Genkinite: Mineral information, data and localities. Named by Louis J. Cabri, John M. Stewart, J.H.T. Laflamme, and J.T. 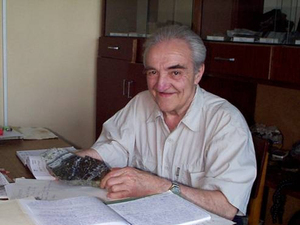 Szymanski in honor of Aleksandr Dmitrievich Genkin (28 July 1919 - 9 July 2010), Russian mineralogist at the Institute of Geology of Ore Deposits, Petrography, Mineralogy, and Geochemistry, Russian Academy of Sciences (IGEM RAS) in Moscow. He was a specialist in the ore mineralogy and geology of the platinum group minerals, in particular working on the Cu-Ni mineral deposits of the Noril'sk area of the Russian Federation. Later in life he was a pioneer of advanced techniques in the search for trace amounts of precious metals in sulphides and sulpharsenides. He helped to describe 20 minerals and was a founder of the journal Geologiya Rudnykh Mestorozhdenii (Geology of Ore Deposits). The Pt analogue of ungavaite. Possibly the Pt-Sb analogue of 'UM1984-07-As:Pd'. Fersman Museum (N79000), Royal Ontario Museum (M34681), Smithsonian (136485). Isoferroplatinum 1 photo of Genkinite associated with Isoferroplatinum on mindat.org. Cabri, L.J., Stewart, J.M., Laflamme, J.H.G., Szymanski, J.T. (1977) Platinum-group minerals from Onverwacht. III. Genkinite, (Pt,Pd)4Sb3, a new mineral. Canadian Mineralogist: 15: 389-392. Fleischer, M., Mandarino, J.A., Chao, G.Y. (1979) New mineral names. American Mineralogist: 64: 652-659. 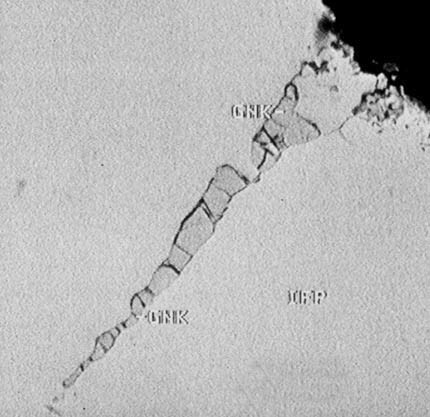 Cabri, L.J., Criddle, A.J., LaFlamme, G.J.H, Bearne, G.S., Harris, D.C. (1981) Mineralogical study of complex Pt-Fe nuggets from Ethiopia. Bulletin de Minéralogie: 104: 508-525. Prichard, H.M., Tarkian, M. (1988) Platinum and palladium minerals from two PGE-rich localities in the Shetland ophiolite complex. The Canadian Mineralogist 26, 979-990. Nixon, G.T., Cabri, L.J., and Laflamme, J.H.G. (1990) Platinum-group-element mineralizaton in lode and placer deposits associated with the Tulameen Alaskan-type complex, British Columbia. Canadian Mineralogist: 28, 503-535. Nixon, G. T., Cabri, L. J., & Laflamme, J. G. (1990). Platinum-group-element mineralization in lode and placer deposits associated with the Tulameen Alaskan-type complex, British Columbia. The Canadian Mineralogist, 28(3), 503-535. Wilson, G., & Harper, G. (2013). Nipigon Reefs Project: A New Look at the PGE-bearing Seagull Mafic-Ultramafic Complex. Field Guide to the Copper-Nickel-Platinum Group Element Deposits of the Lake Superior Region, Precambrian Research Center Guidebook, 13-01. Cabri, L. J., Criddle, A. J., Laflamme, J. H. G., Bearne, G. S., & Harris, D. C. (1981). Mineralogical study of complex Pt-Fe nuggets from Ethiopia. Bulletin de Mineralogie, 104(4), 508-525. Tony Nikischer specimen and analysis; Sidorov, E. G., Tolstykh, N. D., Podlipsky, M. Y., & Pakhomov, I. O. (2004). Placer PGE minerals from the Filippa clinopyroxenite-dunite massif (Kamchatka). Geologiya i Geofizika (Russian Geology and Geophysics), 45(9), 1128-1144. Zhmodik, S. M., Nesterenko, G. V., Airiyants, E. V., Belyanin, D. K., Kolpakov, V. V., Podlipsky, M. Y., & Karmanov, N. S. (2016). Alluvial platinum-group minerals as indicators of primary PGE mineralization (placers of southern Siberia). Russian Geology and Geophysics, 57(10), 1437-1464. Minerals of South Africa; Melcher, F., & Lodziak, J. (2007). Platinum-group minerals of concentrates from the Driekop platinum pipe, Eastern Bushveld Complex Tribute to Eugen F. Stumpfl. Neues Jahrbuch für Mineralogie-Abhandlungen: Journal of Mineralogy and Geochemistry, 183(2), 173-195. Canadian Mineralogist(1977) 15, 389-392; Cabri, L. J., Laflamme, J. G., & Stewart, J. M. (1977). Platinum-group minerals from Onverwacht; II, Platarsite, a new sulfarsenide of platinum. The Canadian Mineralogist, 15(3), 385-388. Prichard, H. M., & Tarkian, M. (1988). Platinum and palladium minerals from two PGE-rich localities in the Shetland ophiolite complex. The Canadian Mineralogist, 26(4), 979-990.